sufficient. The lower coil of the ITS transfers the heat from the collectors. This indirect solar system has a high comfort level because the water heater or boiler as well as the collectors transfer the heat to the ITS. An ITS solar system is a very suitable application in residential and small commercial properties. This system will provide the needed hot water in a very energy efficient manner. 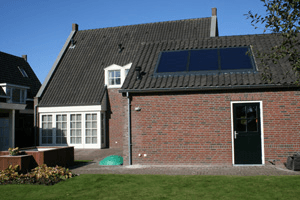 The house on the pictures is fitted with an ITS 300 solar system with 3 collectors. The Smart Display shows the temperature in the collector, the temperature of the water in ITS and, if combined with an output sensor, the solar contribution. The Smart Display and the output sensor are available as accessories.